 An odyssey of recovery by a woman literally struck by lightning. In the summer of 1991, Ehrlich (Islands, The Universe, Home, 1991, etc.) was hit by lightning while out walking with her dogs on the land around her Wyoming ranch. Ehrlich has not written another near-death testimonial but a peripatetic probe into the nature of the healing of the human heart. 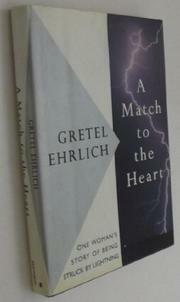 Suffering from ventricular fibrillation (chaotic heartbeat) and a ``fried'' sympathetic nervous system (which is responsible for stimulating the heart muscle and raising blood pressure), Ehrlich is rescued from bumbling, ineffectual treatment in Wyoming that might have killed her and delivered into the hands of a heart specialist/healer named Blaine in Santa Barbara, Calif. The drama of her shaky recovery is more gripping than the final two-thirds of the book, which meanders from musings about various cultural readings of lightning, the heart, and death to thoughts about the healing power of water over lightning and fire as Ehrlich treks to London, then zigzags back and forth between California and Wyoming, then on to Alaska before finally coming to rest off the Santa Barbara coast after a symbolic dive into the ocean. At times the prose is a pedestrian record of events: retrieving her favorite dog or following cardiologist Blaine on his rounds. At other times, Ehrlich strains to give her experience more depth and insight by interspersing the mundane with, say, Ecuadoran myths about the connection between being struck by lightning and becoming a shaman. Ehrlich may want these myths to be ``enlightening,'' but she is at her best when she writes from her own feelings: ``Lightning had entered me twice and now I was a burnt shell with nothing in me that could attract fire.'' An emotionally compelling, if erratically beating, tale about the transformative power of a brush with death by lightning.